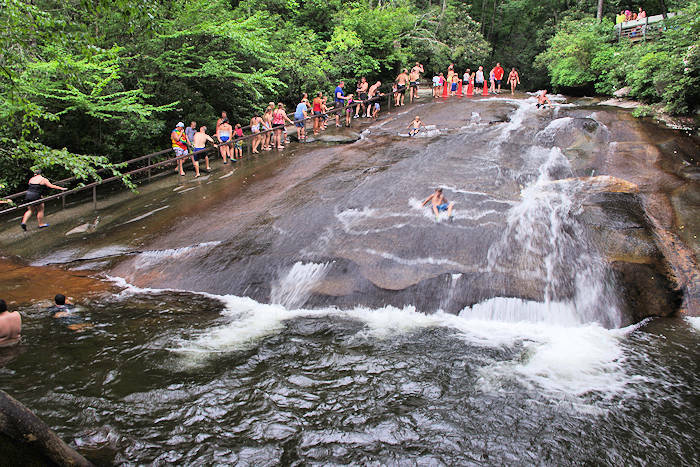 At Sliding Rock each summer, thousands of children and adults slip and slide down this favorite natural mountain waterfall in Pisgah National Forest, near Brevard and Asheville, North Carolina. Sliders patiently line up and wait their turn as one-by-one they ride the chilly water (50-60 degrees!) down the 60-foot flat, sloping boulder. They make a splash in an eight-foot deep pool and swim a few strokes to the shore, get in line, and do it all over again. 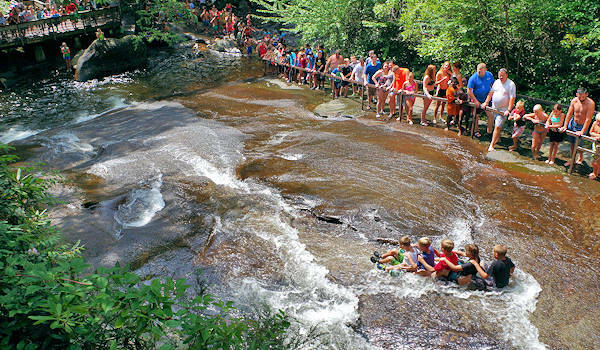 This natural water slide, located eight miles from Brevard, is fueled by 11,000 gallons of water flowing down the rock each minute. It is extremely popular on hot summer days, so be patient! There are plenty of areas to relax on rocks or watch from observation decks. Sliding Rock closes for high water or lightning due to summer storms. Check their Twitter Feed for daily updates on closures. Cost to enter the recreation area is $3 per person when staff members are on duty (cash or credit card). Children 3 and under are free. It is free to visit during "off" hours (but restrooms are closed and donations encouraged). Do not slide during high water or thunderstorms. There are several observation areas to watch the sliders. So, it's a great place to visit even if you don't want to get wet. Bring cash or check for admission, $3/person. Credit cards now accepted. The pool at the bottom of the falls is eight feet deep. So you must know how to swim! Children under 7 years must slide with an adult. Life jackets are the only flotation device allowed. Water shoes are recommended for sliding on the rock (and rugged shorts / swimsuits since you are sliding across a big rock!). The parking area fills up and closes periodically on summer weekends. For a more enjoyable visit, avoid peak visiting hours of 12-4 PM on Saturday and Sundays. The parking area also fills up on some weekdays in July. Slide in sitting position only. Bring drinking water to stay hydrated on the hot summer days. Some snacks and drinks, towels and water shoes are for sale on busier days. Don't expect wi-fi or even mobile phone reception. Pets are allowed in the area, but they must be on a leash and cannot slide. To avoid congestion in the parking lot, no picnicking is allowed. Picnic at nearby Pink Beds, four miles away. And find riverside tables nearby along US 276. The nearest food is at the Cradle of Forestry Cafe - turn left from Sliding Rock and go four miles. Or turn right and go eight miles to Brevard for many options for food, ice cream, breweries and more (read about Brevard). 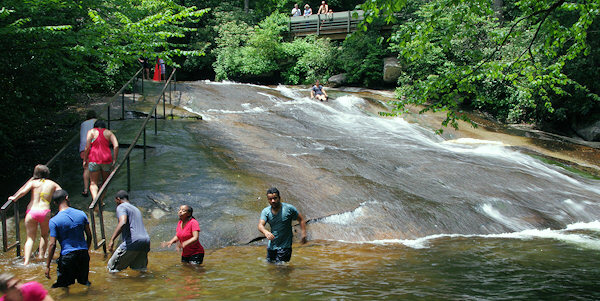 For latest updates, the phone hotline for Sliding Rock is 828-885-7625. The phone number for the nearest Pisgah Forest Ranger Station is 828-877-3265. Note: GPS is often not accurate and gets you lost in this area! And cell service is limited. Use these directions! From Asheville (38 miles from downtown), drive I-26 East to Exit 40 for Highway 280 (and the Asheville Airport). Take a right onto Highway 280 West and go 16 miles toward Brevard. As you enter Brevard, watch for a big shopping center on the right (with Wal-Mart). Just past the center, turn right onto US Highway 276 North (Forest Heritage Scenic Byway) to enter the Pisgah National Forest. Go 7.6 miles to a parking area on the left. From the Blue Ridge Parkway Milepost 412, take US 276 South about 7.5 miles. 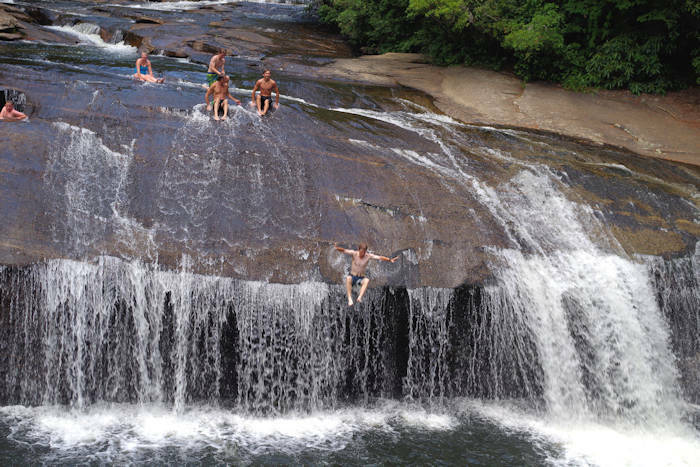 Sliding Rock is located along the Forest Heritage Scenic Byway in Pisgah National Forest, with plenty of other things to see and do nearby, including roadside Looking Glass Falls and hikes to Looking Glass Rock, Daniel Ridge Falls, and Pink Beds. The Cradle of Forestry has family-friendly trails and many historic buildings and activities for kids (4 miles away). 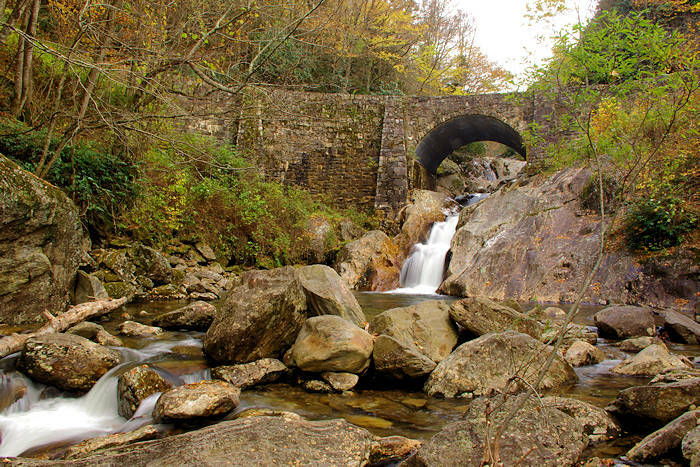 For more, see our Pisgah Forest Waterfall & Hiking Map. 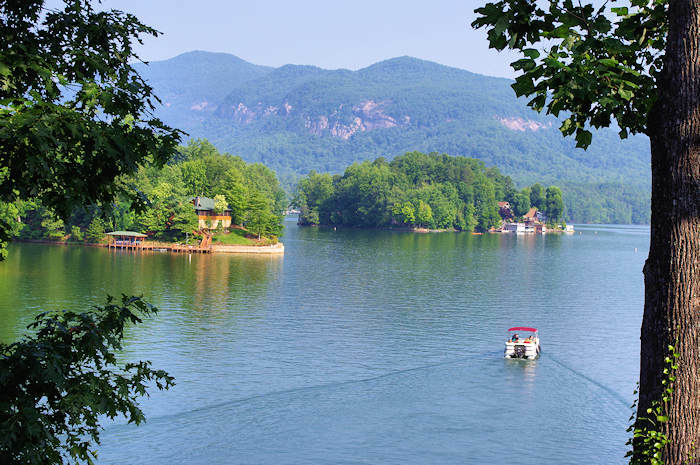 Find other swimming spots in Blue Ridge Mountains of NC. 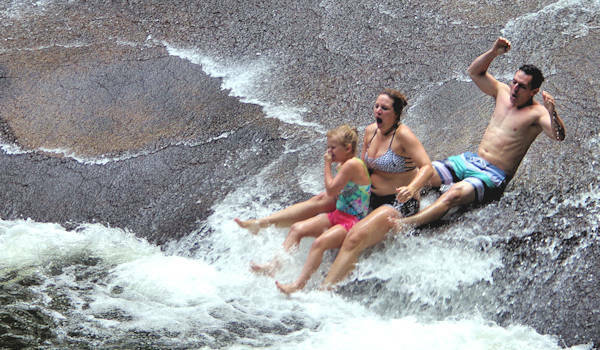 For a similar natural slide more for adults, check out Turtleback Falls.